A nice and tasty midweek tea that doesn’t need much too much effort. Inspired and tweaked from a recipe in Olive magazine. 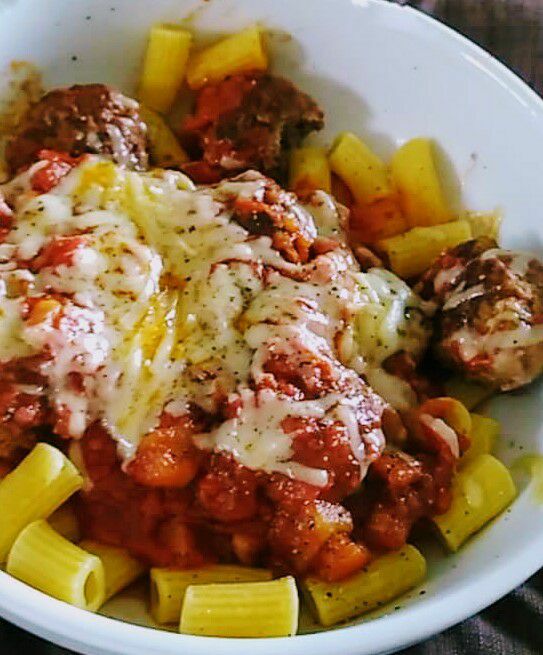 I am aware that I have quite a few meatball recipes already on the blog but I really enjoyed these meatballs and would like it again so I am posting for my benefit as well as yours so I can remember although I do still have half of the meatballs I made in the freezer for next time! I normally mess about putting way too many ingredients in my sauces but this has proven to me that sometimes less is more. Use lean mince and its pretty healthy too. 1 aubergine – peeled and cut into small cubes 1-2 cm squared – optional. I just needed to use one up. Put the mince, breadcrumbs, egg, grated onion, herbs, fennel in a bowl and season with salt. Squidge it all together so evenly mixed and make into medium sized meatballs. Heat some oil in a pan and fry them on all sides so that they are all brown on the outside (not cooked through) then set aside. If you put them straight in the sauce they will just fall apart. Heat some more oil in the pan and gently fry the garlic and aubergine until soft, then add the tomatoes, passata, sugar, vinegar, chilli flakes, butter and some salt to season. Simmer for about 5 minutes then add the meatballs and simmer for another 5 minutes until they are cooked through. Serve with your choice of pasta and top with grated cheese and black pepper. Next Cheesy Garlic Mushroom Soup with toasted Brioche Bread.